Babies' nappies have become the latest casualty of Iran's faltering economy, with huge price rises and shortages across the country. In the course of their conversation, Ayatollah Khamenei mentioned the shortage of nappies, blaming it on "the enemy" who "wants people to make angry with the government". He had, maybe unintentionally, touched a nerve and, soon after, nappies started trending on Iranian social media, with everyone pitching into the debate. Hardliners blamed government mismanagement, the government blamed US sanctions and businesses profiteering and those in favour of regime change blamed the Islamic Republic. Since March, the Iranian currency has lost almost two-thirds of its value against the US dollar, hitting record lows amid concerns about the adverse effects of the Trump administration pulling out of the nuclear deal and re-imposing sanctions on Iran. This has resulted in a big rise in the price of imported goods. While a large chunk of the nappies sold in Iran are made domestically, manufacturers rely on imported raw material. This has resulted in the price of nappies soaring in the past few months. 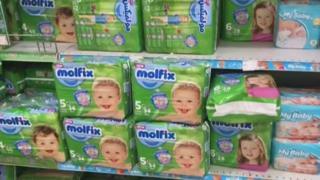 In one case, for example, the price of a pack of Iranian-made nappies rose from 380,000 rials ($9; £7) in late April to 850,000 rials in late August - a 137% increase in just four months. These rises are not just putting pressure on family finances. In some cases they are beginning to impact on peoples lives and plans. Ali lives in the north-eastern city of Mashhad with his wife and their one-year old child. He told BBC Persian they had been planning to have a second child. But due to the soaring cost of nappies and other recent price rises they have given up on the idea. "Raising just one child will be an achievement in itself," he says. Apart from nappies, the prices of adult incontinence pads and sanitary towels have also increased, and they are also in short supply. Moslem's elderly father suffers from both Alzheimer's and Parkinson's disease, and he relies on incontinence pads. "They were 200,000 rials a pack back in March," Moslem told the BBC. "Now they are over 500,000 rials, if I manage to find any at all." Has Iran's economy benefitted from the nuclear deal? He says he may be forced to use cloths instead, "like we used to the old days". Sanitary towels are also getting more difficult to find. Image caption Iran's supreme leader Ayatollah Khamenei (L) has blamed nappy shortages on "the enemy"
"They're not like expensive cars that you can live without," says Sama, from Tehran. "Every woman, rich or poor, needs them every month." And just as they did with the nappies, some Iranians on social media say they have recently bought pads in bulk, fearing price rises and shortages. While the price increases are largely due to the devaluation of currency, the shortages are also being caused by customs delays and businesses hoarding supplies. On Sunday local authorities in Savojbolagh, 80km (50 miles) west of Tehran, said they had raided a warehouse and discovered a million packs of nappies. But there is also another reason why supplies of both imported nappies and the raw materials needed to manufacture them are not reaching end customers. When exchange rates started to rise, the government said it would allocate subsidised foreign currency to importers to keep prices down. But that decision had an unintended consequence. Instead of using the currency to import goods, some businesses simply sold it on the black market to make a quick profit. In response, the Iranian central bank reversed the policy, and announced that businesses would now have to pay back the difference between the subsidised and actual exchange rates before they were allowed to import the goods. This has led to nappies and raw materials being stuck at customs, exacerbating the shortages. A trade body representing manufacturers said recently that 10 nappy factories had stopped production for lack of raw materials. A second wave of US sanctions affecting Iran's oil exports and the central bank is due to take effect on 4 November. The Trump administration says it wants to cut Iran's oil exports to zero - which would deprive the Iranian government of its biggest source of hard currency. If that happens, the Iranian currency may continue to fall, and the nappy crisis could be just the beginning.